This week’s episode of The Adelaide Show, will introduce you to Captain Harry Butler, the first person to fly across the Gulf St Vincent to Yorke Peninsula, which he did on the 6th of August, 1919. Our guests tonight are writing a book about Harry Butler, Les Parsons and Dr Sam Battams. This week, the SA Drink Of The Week is a wine from GISA. In IS IT NEWS, Nigel challenges us on stories about aviation. In 100 Weeks Ago, we take you back to episode 149 for our night in a rooster coop. In a Story Without Notice, we have a magical story about mushrooms. And in the musical pilgrimage … we have a song from Elsy. The missing mushroom picker and his dogs. 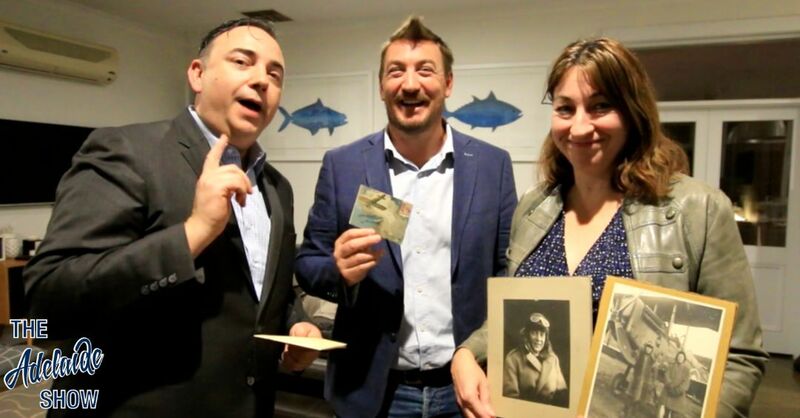 August next year, 2019, will mark 100 years since Captain Harry Butler became the first person to fly from Adelaide, across the Gulf St Vincent, to Yorke Peninsula, where he delivered mail to a waiting crowd in Minlaton. Although he wasn’t the first South Australian to fly, he chalked up a staggering number of firsts as he pursued his passion for flying that embodies the saying, The sky’s the limit. A book about the fearless aviator is due out soon and its authors, or pilots, are Les Parsons and Dr Sam Battams. Who’s the pilot, who’s the co-pilot on this project? Tell us more about that flight 100 years ago. It was more than just the first mail flight across the Gulf, wasn’t it? Why did he choose Minlaton? How did he get involved in the RAF during WWI? Did he really invent Airmail? What did he set up at Northfield? Was he alone as an aviator in SA? What was the Red Devil? What sort of flying did he do, apart from his mail runs? Tell us about the crash that ultimately claimed his life? Where can we see his memorials? monoplane in which the -late Capt. Harry Butler used to fly. BETWEEN 3,000 and 5,000 people were thrilled at Parafield Aerodrome this afternoon by an aerial display conducted under the auspices of the South Australian Aero Club. In addition to witnessing an exciting and varied programme arranged to commemorate Empire Air Day, onlookers inspected the various machines on the flying field. They paid particular attention to the automatic control blimp, the first machine of its kind seen in Australia. Early in the afternoon eager eyes scanned the horizon for the arrival from Western Australia of the blimp at the aerodrome. The pilots of the blimp, Messrs.H. A. de Kantzow and C Gatenby reported on arrival that an excellent trip had been experienced, although head winds had delayed the flight slightly. The automatic blimp maintained an average speed of 50 mph whilst flying in a perfectly straight course using magnetic compass control. The pilots spent last night on a sheep station about 150 miles from Ceduna. Scheduled In time to become one of the most important flying events of the year, the heats for the 1935 public schools’ head of the air race, conducted by the Aero Club, will be flown at Parafield (weather permitting), at 2 pm. on Sunday. Open to all pilots in South Australia, who attended one of the big public schools, and who have completed a minimum of 40 hours solo flying or who have completed the advanced course approved by the Civil Aviation Department. In former years only three schools, St. Peter’s College, Prince Alfred College and Adelaide High School, have been represented. This year, however, added Interest will centre round an entry from Girton House Girls&#39; School, whose representative will be Miss Brownie Lunn, one of Adelaide’s leading girl fliers. This will not be the first time Miss Lunn has flown in an air race, as she won the club trained women’s race at Parafield two years ago from Miss Helen Cato. We opened the vault to go back 100 weeks to a night in the Rooster Coop with Andrew Montesi and James Begley of the Rooster Radio podcast. Andrew had some empassioned words to say about success, namely that an important ingredient is an appetite for risk. And our song this week is Intuition by Elsy, selected by our musical curator, Todd Fischer. Elsy has been pretty chuffed by the work of Chris Eastall as the Executive Producer, and Leon Tran who was the Photographer for the Track Art Cover.